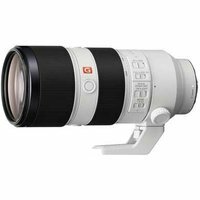 The Sony FE 70-200mm f2.8 GM OSS telephoto zoom joins Sony's flagship G Master (GM) brand of professional interchangeable E-mount lenses. The lens comes with a dust and moisture resistant body and offers extremely high rendering, AF performance and image stabilisation, making it a versatile choice for shooting wildlife, sports, weddings, gigs and a variety of other events. Additional features include a 0.96m minimum focusing distance, Optical SteadyShot image stabilisation for capturing sharp, blur-free images and an advanced double-linear and ring SSM for fast, accurate AF during still and video work.